City law firms unimpeded by banking relationships will be seeking a place on a new Financial Services Authority (FSA) panel of external advisers to carry out investigations into financial institutions. The panel, which will be announced in spring next year, will comprise firms that will compile reports under section 166 of the Financial Services and Markets Act (FSMA), also known as ‘skilled person’ reports, as part of the FSA’s drive towards a risk-based regulatory approach. The FSA put out a tender questionnaire in October as part of its process to appoint the panel. The FSA will use firms on the panel when a financial services institution finds itself in trouble, using the reports to decide whether to fine or impose other sanctions. By the time you read this the Herbert Smith Freehills merger will be live – a firm with revenues of over $1.3bn and more than 2,300 lawyers. After a difficult few years for Herbert Smith, will the merger be the right medicine for the firm? Well, it’s not a cure-all but it’s a good start. In 2002 LB made the bold move of placing Herbert Smith into the Magic Circle. But ten years on, has the firm kept up the pace? What a difference a decade makes. In the April 2002 edition of LB, we sparked widespread debate when we placed Herbert Smith into the Magic Circle (see ‘Fellowship of the Circle’, LB123). 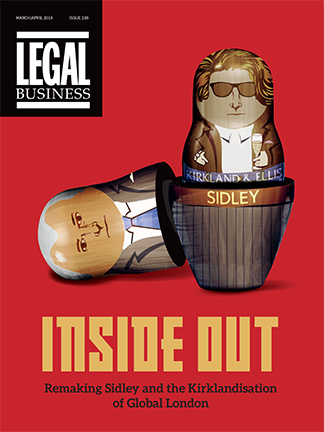 We called it the ‘biggest change at the very top of the legal market since the merger of Clifford Turner and Coward Chance’ and praised the UK firm for its leading European corporate practice, its stellar financial performance and its successful challenge to the perception that it was a litigation-only firm. Corporate trends were the talk of the hour at the third annual LB round table discussion in conjunction with McCann FitzGerald. But what does 2012 have in store for the corporate lawyer? Creativity levels among global corporate lawyers appear to be at an all time high. With the eurozone crisis looming over the global M&A market, the new Takeover Code and the huge swathes of restructuring and refinancing work still to come through to the marketplace, never before have corporate lawyers had to think so differently. Got any advice for a budding young real estate lawyer? ‘Become an accountant,’ laughs veteran Herbert Smith real estate partner James Barnes, as he surveys the moribund UK property market.